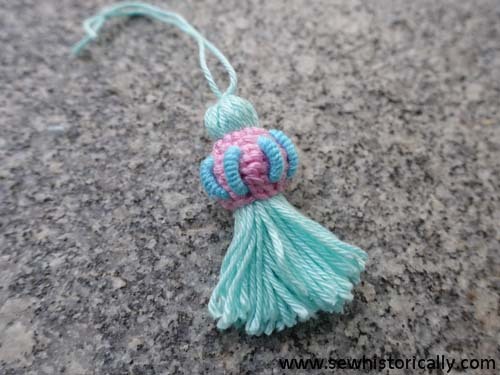 In this tutorial I’ll show you how to make this decorative tassel. 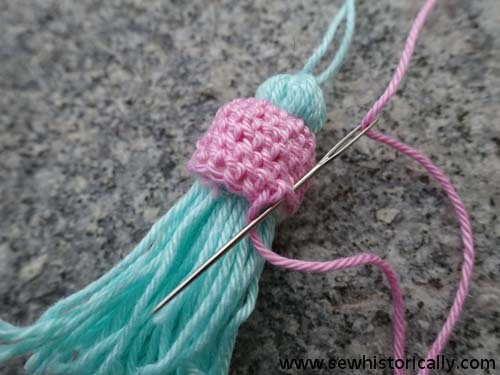 First make an ordinary tassel: Wrap the yarn round your hand. 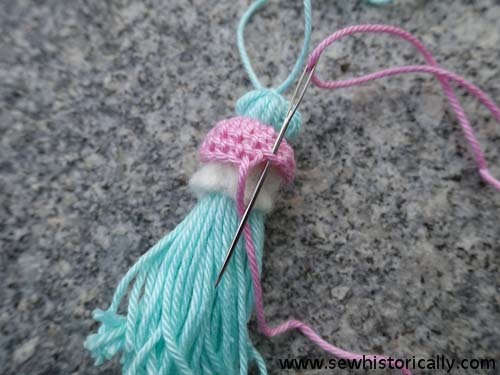 With a short piece of yarn tie a knot to secure the loops. … and sew it in place. 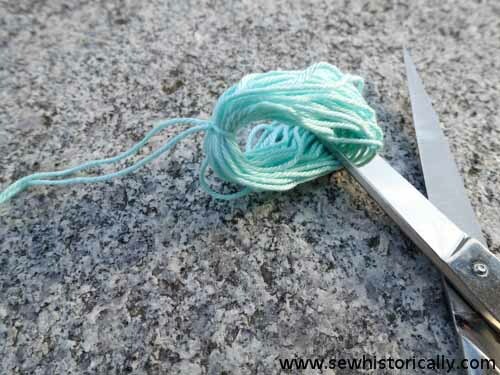 Cut a long piece of yarn to cover the wool felt. 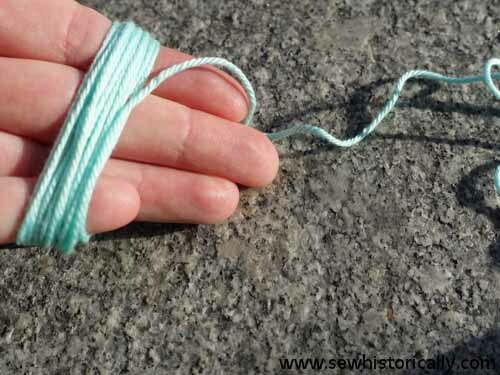 Tie a knot at one end of the yarn and hide the knot behind the wool felt. 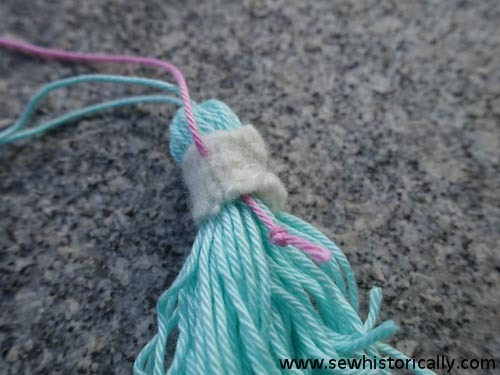 Wrap the yarn three times round the tassel above the wool felt. Now begin to cover the wool felt with buttonhole stitches. 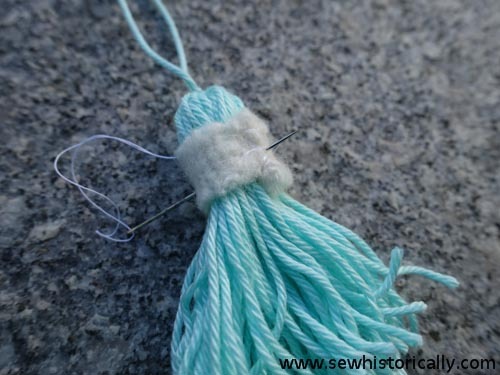 Continue to sew buttonhole stitches round the tassel till the whole felt piece is hidden. 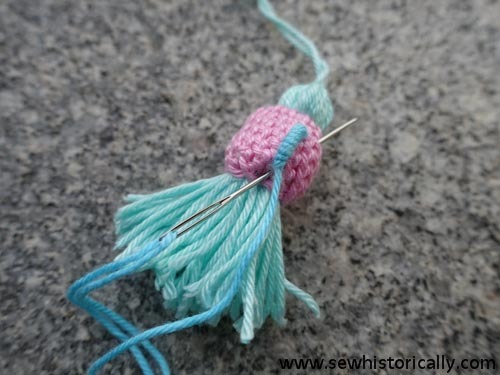 Make less buttonhole stitches in the last row. 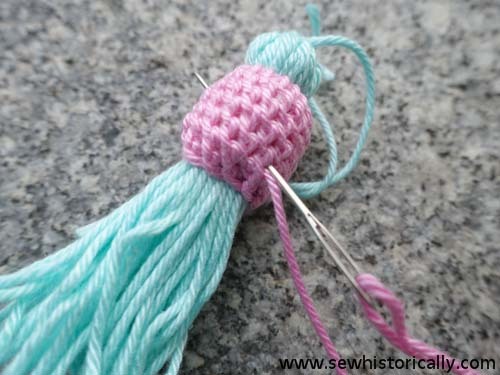 To secure the thread, sew 2 or 3 times through the head of the tassel before you cut the yarn. 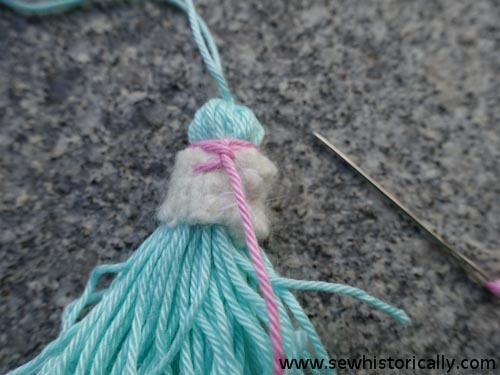 Now trim the uneven yarn at the bottom of the tassel. 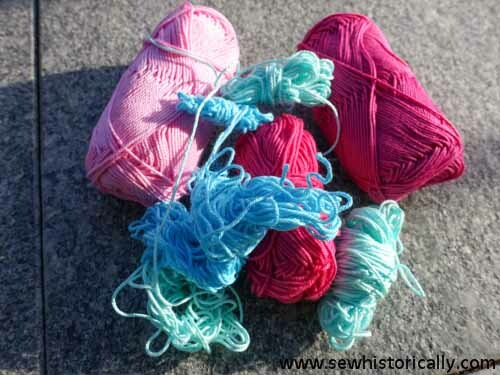 Cut another long piece of yarn in another color, and hide the knot again. 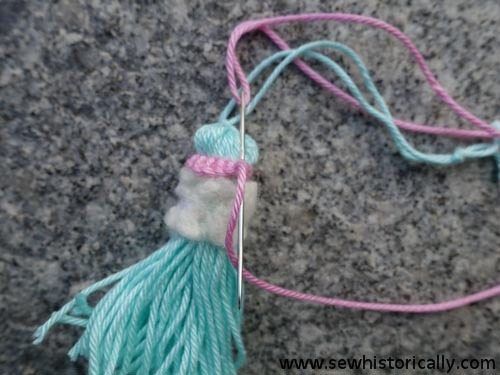 Sew bullion stitches round the tassel head. 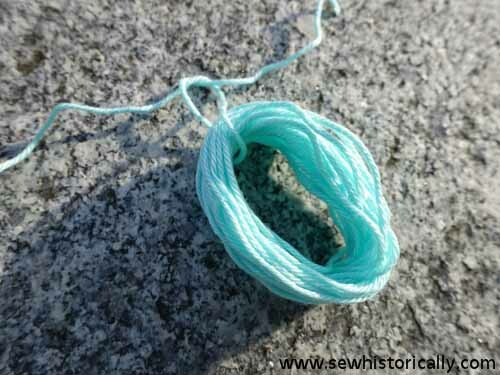 For each bullion stitch wrap the yarn about twelve times round the needle. 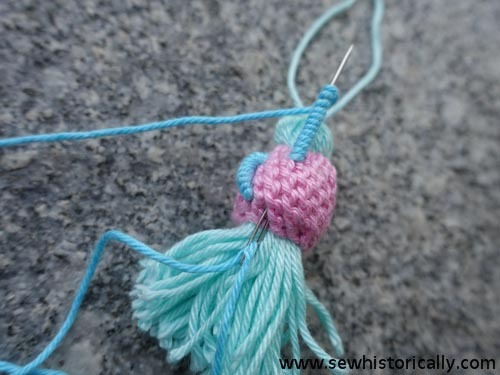 When all bullion stitches are finished, secure the yarn again inside the tassel head. 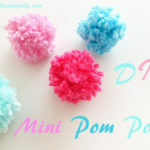 If you liked the tutorial, please share it on Pinterest, Facebook, Twitter etc. Thank you! 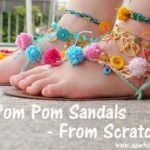 DIY Pom Pom Sandals – From Scratch! 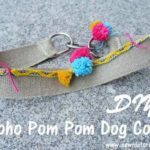 This is a craft that I can actually do. Thanks for sharing. That’s really clever! Great tutorial. Thank you for sharing. 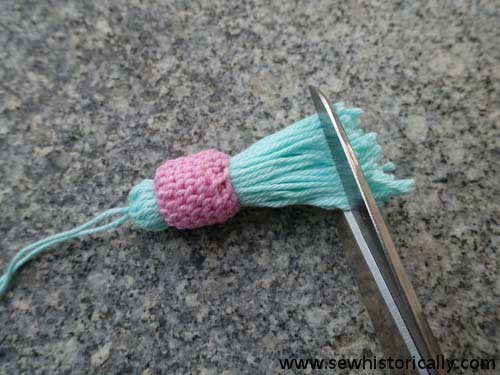 I made a tassel for my embroidery ….. didn’t have a clue where to start, although I made it eventually, and so I was even more interested to read your method for a woollen tassel. I hope it’s OK to Pin for future use! I love tassels!!! This is so different! 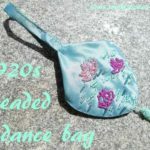 Thank you for sharing at Sweet Inspiration Link Party ! 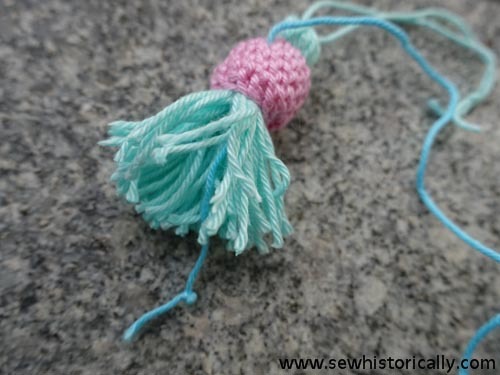 I enjoyed teaching children how to make a tassel at camp last week. But I love the extra pizzazz you’ve added to yours! Thank you for the ideas and the tutorial. Pinning! 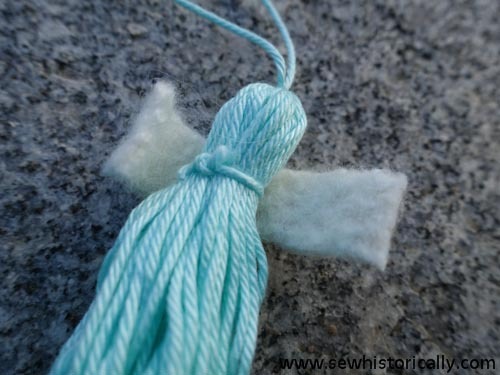 This is a beautiful tassel. Thanks for explaining it in such a clear tutorial with plenty of photos. I think anyone could follow your directions. 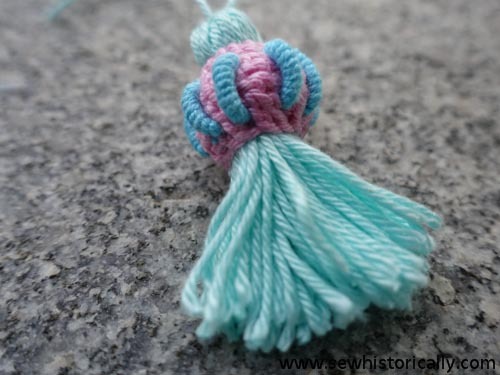 Tassels like this are so useful in home decor, DIY jewelry, or fashion. 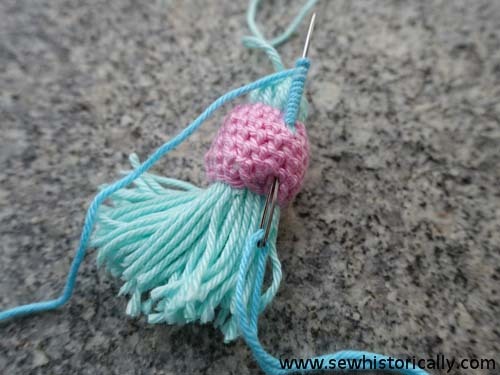 My grandmother taught me to make tassels as a girl. Thanks for reminding me of the sweet memory! Thank you for sharing @Vintage Charm! 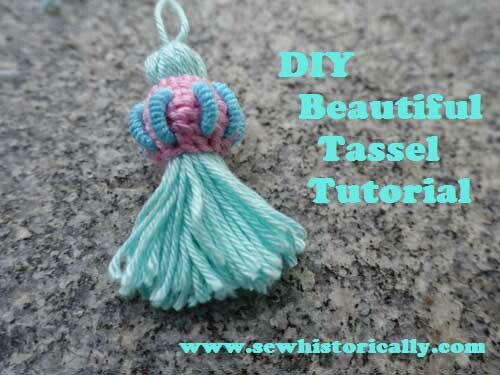 Thank you for sharing a tutorial for this tassel. So nice. I am pinning as I am sure I will be making these for various home made blankets I want to make this fall. 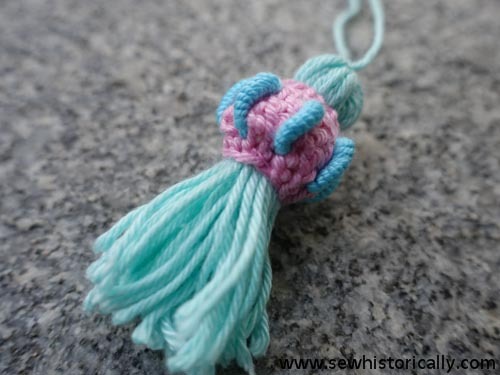 What a creative way to make a tassel! 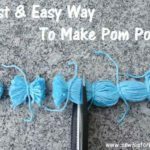 You really elevate a simple tassel craft into something beautiful and crafty. So lovely! It is so beautiful, that I thought it would be much more complicated than that! I love it.